1142 was built by the Great Southern & Western Railway at Inchicore Works in 1921 as one of a pair (with 1143) of all-first compartment coaches; they followed another pair (1140 and 1141) constructed the previous year. 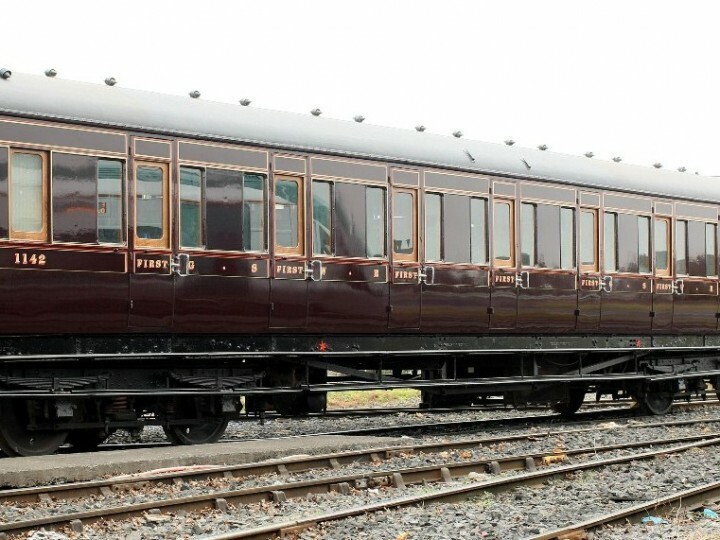 1142 comes from the twilight era of GS&WR carriage construction, with only a handful more being constructed at Inchicore prior to the creation of Great Southern Railways in 1924. The coach features seven compartments, which accommodate six passengers each, and also include individual external doors. Its side corridor has three external doors and features its own curved ceiling, something not found on later compartment stock. Unlike the stock of other companies which gained a suffix to its number (M for ex-Midland Great Western Railway vehicles, etc. ), as an ex-GS&WR vehicle 1142 would remain with its number unaltered throughout its GSR career. - Height over rail 12'7"
- Width over door handles 9'2½"
The railway companies certainly got their money's worth out the vehicle. It outlived the GSR, which became part of Córas Iompair Éireann (CIÉ) in 1945. It would have been repainted in CIÉ's dark green livery, complete with flying snails. It continued in front line service for almost a further two decades before being reduced to a standard class reserve coach (for use on specials, etc.). 1142 was declassified and renumbered to 1285 on 1st April 1961, and further re-numbered to 4012 in 1969. 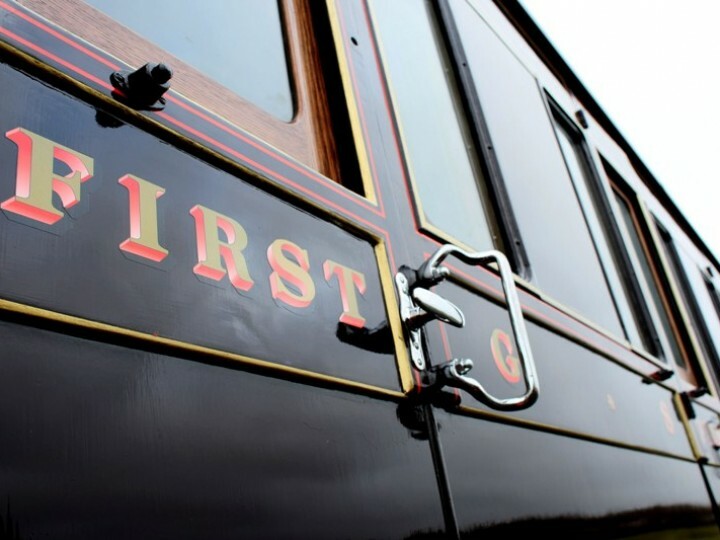 By now in CIÉ's 'black and tan' livery, this coach continued through the 1960s rubbing shoulders with more modern laminate and Cravens stock, behind Metrovick and GM diesels that were light years from the Edwardian steam locomotives that originally hauled her. By the time the coach was withdrawn in 1972, it had completed well over fifty years in traffic, an achievement unlikely to be surpassed by more modern coaching stock. 1142 was sent to Mullingar for scrapping but fortunately was spotted by the Society, then only dipping its toes in carriage preservation. A group of volunteers funded its purchase and it was transferred to Whitehead by No.171on 27th October 1973. 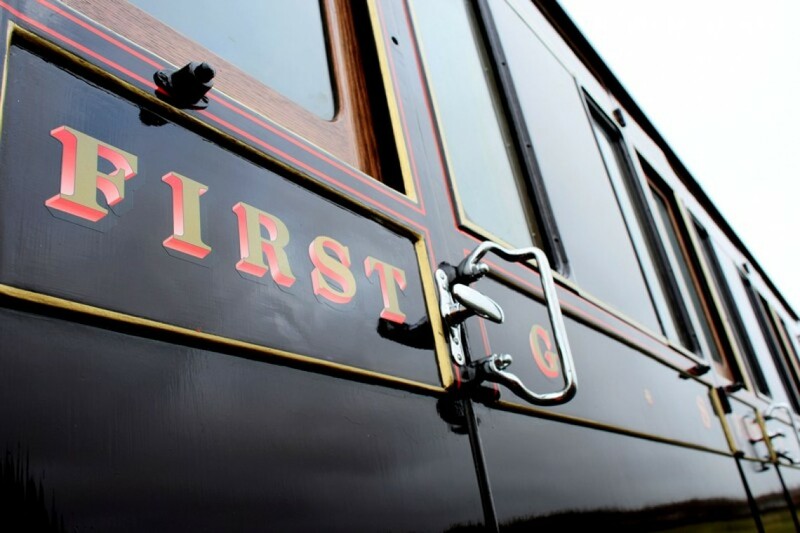 Unfortunately, the coach had suffered from vandalism, and was in need of much loving care and attention. It would be the early 1980s before the restoration of 1142 could begin in earnest, but begin it did, and 1142 finally emerged in 1983, one of her first duties being film work for the BBC production "Aunt Suzanne". 1142 spent over a decade as part of the Whitehead based set of carriages, before transferring to Dublin in 1996, No.85 bringing to the Inchicore Works 150 open weekend. The vehicle has remained in Dublin ever since. In 2000 1142 was repainted into early 20th century brown and cream GS&WR livery to run with the then newly restored State Saloon 351. It continued to run with the Dublin based wooden-bodied carriages until 2005, when it was withdrawn for a major restoration project run by former Inchicore coach builder George Dempsey and the late Charles Meredith. Appropriately, this restoration took place in the former Carriage One shop in Inchicore, her birthplace. After three years of Trojan work and perseverance, 1142 emerged once more in November 2008 resplendent in original GSWR deep purple lake livery and lined out in gold and vermillion. With the kind co-operation of Iarnród Éireann, 1142 is now kept indoors but is brought out for special occasions and charter work. 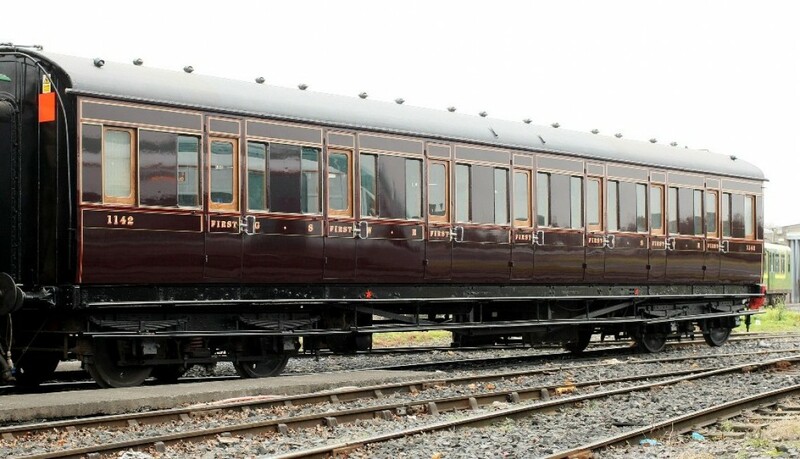 A very important piece of history, and one of the few surviving Irish First class coaches, 1142 is a coach to be treasured and is testament to all those who have built, maintained and restored it over the past century.